Ruby red grapefruit; photo by Matthew Kirkland on Flickr (noncommercial use permitted with attribution). A fairly new citrus, grapefruit is believed to be a cross between a pummelo and an orange. Texans have grown grapefruit in the Rio Grande Valley for about 100 years. 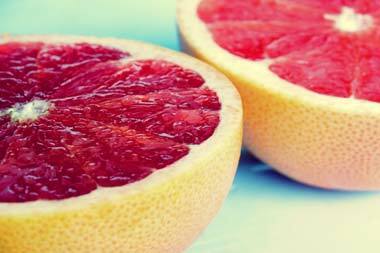 Around 1929 a mutation on a single tree became the famed Texas Ruby Red, which received the first-ever patent awarded to a grapefruit. The grapefruit family includes white, red (sweeter than white), pummelo (father of the grapefruit and the largest citrus), minneola (cross between tangerine and grapefruit), and sweeties (cross between the pummelo and the grapefruit). RESOLVED, That the 73rd Legislature of the State of Texas hereby designate the Texas Red Grapefruit as the official State Fruit of Texas. 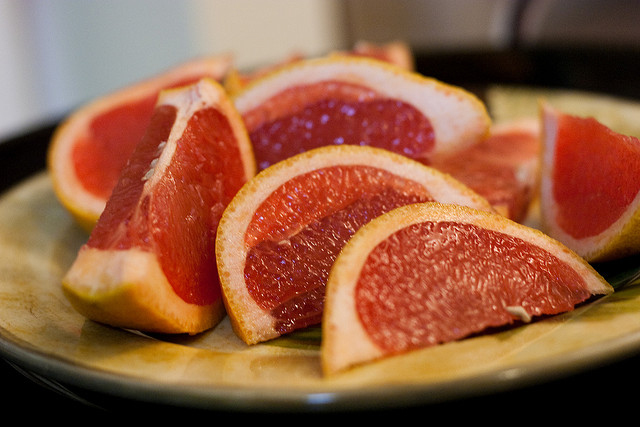 Ruby red grapefruit slices; photo by mellowynk on Flickr (noncommercial use permitted with attribution / share alike). Texas license plate with red grapefruit; photo from Texas Farm Bureau.